Are Trout Made of Trees? Lethbridge, AB, October 18, 2017 – The Helen Schuler Nature Centre, Trout Unlimited Canada – Oldman River Chapter and Lethbridge Public Library are proud to bring a StoryWalk® to the Lethbridge Nature Reserve. The book Trout Are Made of Trees by April Pulley Sayre can be enjoyed along Nature Quest trail, located close to the Helen Schuler Nature Centre, until November 21st. StoryWalks® are an opportunity for people to experience reading a book while walking through an area such as a park, trail or neighborhood. 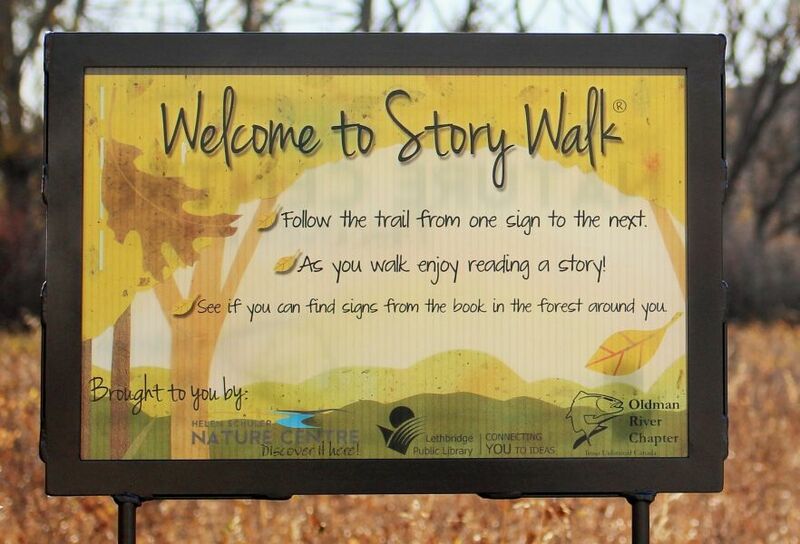 StoryWalks® promote literacy, outdoor physical activity and encourage community involvement. “People of all ages will enjoy the stunning illustrations and important messages found in this book. There will be several activities set out along the trail that help people connect the book with the local environment,” says Jessica Deacon-Rogers, Technician with the Helen Schuler Nature Centre. “What a wonderful opportunity for people to ponder the words and images of Sayre’s book in the incredible, immersive environment of the Nature Reserve. It’s such a lovely walk along the Nature Quest trail. This is an ideal outing to enjoy the natural environment in our own community,” adds Barbara Longair, Manager: Public Services & Children’s Services, with Lethbridge Public Library. Thanks to a donation by the local Trout Unlimited chapter this will be one of many StoryWalks® the community will be able to enjoy. “Trout Are Made of Trees is an excellent way for people to realize the connection between people and our local aquatic environment,” says Josh Markle with Trout Unlimited Canada – Oldman River Chapter. You can enjoy the StoryWalk® on your own daily from dawn to dusk on Nature Quest trail in the Lethbridge Nature Reserve. Trout Are Made of Trees is also available to borrow from the Lethbridge Public Library.